Radical Party leader Oleh Liashko has reported that he met with Ukrainian President Petro Poroshenko and they discussed establishment of the coalition at new Verkhovna Rada. "Just now a meeting with Ukrainian president came to an end. We discussed formation of the coalition at new Rada. 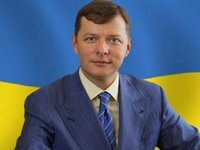 New government must be established as soon as possible to address the concerns of people and to protect Ukraine, "he wrote on his Facebook page on late Thursday.